Background: Interferons (IFNs) are functional proteins of vertebrate cells that have been conserved throughout evolution. Antiviral response in cells and uncontrolled cell proliferation of lymphocytes and macrophages are influenced by IFNs. B and T cell functions are influenced by these molecules in vitro and in vivo. These facts are confirmed by the effects on different conditions: antibodies production, T cells' cytotoxicity, allograft survival, delayed-type hypersensitivity reactions. Some IFNs are produced as a result of antigen recognition by T cells, and in turn, they modulate Natural Killer (NK) cell and phagocyte activities and functions. On the other hand, there are viral infections without immunological specificity, which involve IFNs and interfere in immune reactions. Some clinical applications of IFNs have been implemented in the recent years, for example for hepatitis B and C treatment. 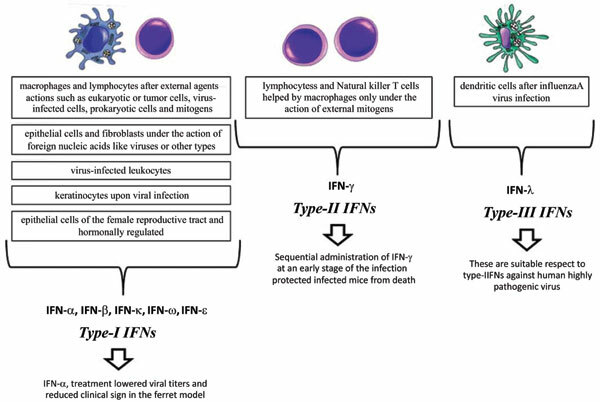 Conclusion: However, in this review, emphasis will be placed on the use of IFNs for the possible treatment of seasonal influenza viruses that have specificity with the upper respiratory tract. IFNs prevent highly pathogenic influenza viruses to disseminate to the lung, assuming their use as an emergency drug against pandemic forms of influenza. Interferons, influenza, immune system, lymphocytes, macrophages, phagocyte.